Handbag Cake Recipe in Just 1-2-3! Totally tasty! A yummy gift for your loved ones. Make up cake using directions on packet and pour into a greased and lined 205x205mm square cake pan. Cook at 180 degrees C (350 degrees F) for about 30 minutes. Cool on a wire rack. Level top of cake with a large serrated knife and turn cake upside down. Cut out cake into a bag shape. Position cake on serving plate/board. On a surface dusted with icing sugar, add pink food coloring and 3/4 of the white icing until evenly colored, then wrap in plastic. Add yellow food coloring into remaining white icing. Spread pink icing to cover the cake. Spread yellow icing to form polka dots all over the cake. 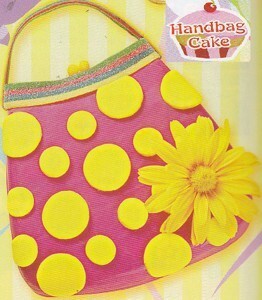 Attach licorice straps, jellybeans, dots and flower to bag using decorating icing as glue. This is one of the most inventive cakes I have seen in a long time. It would suit anyone from kids to grown women. For birthdays or showers, the instructions are uncomplicated, and I cant wait to try it for a bridal shower I am having in August. The oven temp is 180 degrees? Isn't that a little low? The idea is cute but cannot believe that the oven temp is right. Editor's Note: The oven temperatures are in Celsius. This would be 350 degrees in Fahrenheit. That was 180 Celsius, not Fahrenheit. I believe that would be 350 degrees F. This is the cutest cake. My niece has a birthday the 10th of June. I am going to ask my sil if she thinks her daughter would like it. Thanks for the great step by step directions.